Yes, it's hot both here in Europe and the U.S., making it easy to forget we were shivering in record cold in March as bouts of northern hemisphere extreme weather continues to fuel concern about climate change and the human cost of it. The UK has been sweating through its first significant heatwave for seven years, sparking public health warnings, wildfires and melting roads. Even so, the 1976 summer still holds the record after temperatures rose above 35 degrees Celsius for five days that year. Across the Atlantic, a stifling heatwave blanketed much of the U.S. over the past week, causing record-breaking power usage in New York City, before the heat was broken by storms sweeping across the country over the weekend. July's heat comes after the National Oceanic and Atmospheric Administration (NOAA) and NASA both ranked June 2013 among the top five warmest (NOAA fifth warmest, NASA second warmest) Junes on record (dating back to the late 1800s). Can you remember though how high pressure systems in the spring spread from Siberia and centered above Scandinavia to bring record cold temperatures to Europe? China was also shivering through its coldest winter in three decades. The northern hemisphere had record snow coverage in December and it was still the 9th highest on record in April (dating back to 1967) but as the summer warmed up, the snow cover plunged to the third lowest on record during May. Arctic sea ice, which receded to a record low in 2012, has also started to melt more rapidly in recent weeks. Although Arctic sea ice extent is not as low as it was in mid-July of 2012, over the past two weeks the ice has melted 61% faster than average. It's not clear if 2013 levels will match 2012's record low, but the rate of the melt is rapidly accelerating. Arctic shipping is now set for a record year. The administrators of the Northern Sea Route (NSR) -- which follows the north coast of Russia -- has granted permission to 204 ships to sail this year compared to just 46 ships that sailed the entire length from Europe to Asia last year. Some scientists are now suggesting the extreme weather is being caused by changes in the jet stream -- a near-continuous high-speed wind flow in the upper atmosphere. Rather than rushing from west to east, the jet stream is starting to weave and undulate north and south giving rise to more changeable and extreme weather -- and raising concern of a long-term shift. While it is always difficult to attribute one period of extreme weather to climate change, scientists agree that global warming will usher in more cases of extreme and unpredictable weather and the clock is continuing to tick. The global climate is changing at an alarming rate, bringing with it ever greater dangers such as sweltering summers, superstorms, wildfires, warming and acidifying of the oceans, melting of the ice caps and rising sea levels. 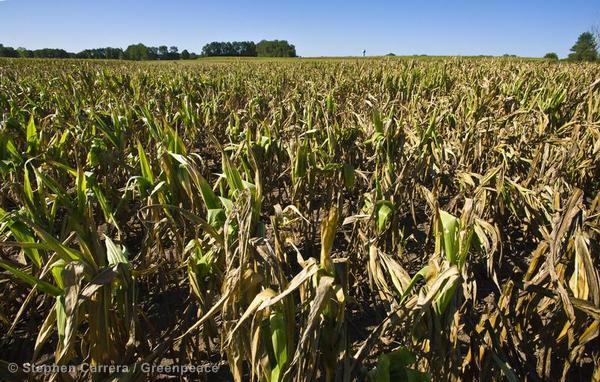 The potential for a food crisis is also increasingly sparking headlines around the world. A UK government committee has warned that farmers face a severe water shortage due to global warming that could put a considerable extra strain on the nation's resources and make Britain increasingly reliant on imported crops. In the U.S. there are growing concerns about the impact on food production. The current heatwave, it has been suggested, will diminish both the quality and quantity of foods originating from the 17 Western states, which account for roughly 40 percent of the net US farm income. All of this is happening now with just 0.8 degrees Celsius of global warming but our current pathway will take us to a 4 degrees increase by the end of the century. Aggressive action to reduce carbon emissions is urgently needed. If governments take concerted policy steps, the worst impacts of climate change can still be avoided. Greenpeace is demanding action now.